The world's deadliest CIA operatives, FDR Foster (Pine) and Tuck (Hardy), are inseparable partners and best friends until they fall for the same woman (Witherspoon). Having once helped bring down entire enemy nations, they are now employing their incomparable skills and an endless array of high-tech gadgetry against their greatest nemesis – each other. Seriously, this was such a great movie to watch. I love romantic comedies and love Reese Witherspoon even more. From beginning to end the story line went smooth and I loved that Chelsea Handler was in this. She's hilarious as always and I think brings a lot of the comedy out in this movie. Chris Pine and Tom Hardy are just as handsome as ever and I loved that they were both CIA's fighting over a girl's heart. Not only is this a chick-flick, but I actually got my husband to sit down and watch it with me and he enjoyed the movie as well, so it's enjoyable for both you and your spouse. Definitely something I would have purchased if I weren't given this to review. Below I have a printable of the Top 10 Things To Consider When Choosing Your Perfect Guy. This can come in handy for those of you out there that are still in the dating scene. 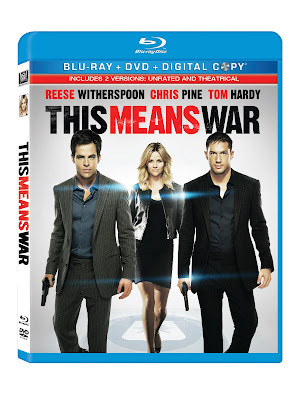 Enjoy and be sure to check back in later this week for a GIVEAWAY of This Means War! Disclosure: All opinions are my own. I received This Is War at no cost for the purpose of this review. No other compensation was received.